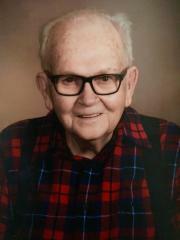 James Kermit “Tom” Campbell, 92, of St.Marys, OH died 2:20 p.m. Friday, November 23, 2018 at Otterbein – St. Marys. He was born August 26, 1926 in Noble Twp. – Auglaize Co., OH to Joseph H. and Mary Ellen (Huffman) Campbell. On November 6, 1948 he married Eileen Ann Hehr, who died October 9, 1993. He then married D. Jean (Snyder) Burkholder on August 5, 1994 and she survives. He was a veteran of the United States Navy, having served in the Asiatic-Pacific Theatre during World War II. He worked at Monarch in Sidney for 21 years, then retired from Ford Motor Co. in Lima, OH after 18 years. He was a member of Wayne Street United Methodist Church in St. Marys, a life member of VFW Post #9289 in St. Marys and a member of Eagles Lodge #767 in St. Marys and American Legion Post #241 in New Bremen, OH. He was a skilled carpenter and woodworker, who built and remodeled homes. Other interests included intarsia crafts, building desks, children’s furniture, kitchen cabinets and other items which he often gifted to relatives and friends. Funeral services are scheduled to begin 10:30 a.m. Friday November 30, 2018 at the Wayne Street United Methodist Church, with the Rev. Tim Benjamin and the Rev. Charles Richtmyer, co-officiating. Military funeral rites will be conducted at the church following the services. Burial will follow at the Elm Grove Cemetery in St. Marys, OH. Visitation 2 – 4 and 6 – 8 p.m. Thursday at the Miller Funeral Home, 1605 Celina Road (Ohio 703 West Chapel) in St. Marys.